A regular consumption of fresh or processed fruits can contribute to preventing cardiovascular diseases and cancer. Polyphenols, which are naturally present in fresh apples (Malus x domestica), are widely acknowledged as antioxidants. Cider apples contain high concentrations of polyphenols, but their composition differs markedly as a function of cultivar. Two of which were studied in this respect. The first cultivar was Marie Menard, which is highly concentrated in polyphenols and has a standard profile showing high levels of hydroxycinnamic acids and monomeric catechins, widely involved in oxidation reactions catalyzed by the polyphenol oxidase; the second one was Guillevic, which has an atypical phenolic profile for a cider apple, with highly polymerized procyanidins and no monomeric catechins, which thus induces a low sensitivity to enzymatic browning. Both cultivars were subjected to osmotic dehydration at two temperatures (45 and 60 °C) or to convective air-drying, and a combination of the two processes was also tested. Phenolic compounds were quantified by high performance liquid chromatography for various processing times and regardless of the quantity of impregnated sugar. The results revealed different behaviors depending on the polyphenolic groups of compounds. Procyanidins were better preserved by the processes than hydroxycinnamic acids or monomeric catechins. Indeed, these latter groups of polyphenols were first of all involved in enzymatic browning but could also diffuse more easily as their molecular weight was lower. Polyphenol retention was also dependent on the process applied. Polyphenols were better retained by convective drying than by osmotic dehydration, and when soaking was applied as a pretreatment, polyphenol losses were limited during subsequent drying. Moreover, the level of sucrose impregnation could mask the astringency of procyanidins. This paper was written after Manuela Zude from ATB in Potsdam selected the oral contribution done on September 2, 2009 at the Fifth CIGR symposium. We would like to thank the IFPC (Institut Français des Productions Cidricoles—French Institute for Cider Production, Sées (61), France) for supplying the cider apples. Thanks are also due to the European Commission for partly funding this study under the ISAFRUIT Integrated Project (FP6-FOOD 016279-2). Fernandes, F.A.N., Rodrigues, S., Law, S.L., Mujumdar, A.S. (2010). Drying of exotic tropical fruits: a comprehensive review. Food Bioprocess Technology. doi: 10.1007/s11947-010-0323-7. Lopez, J., Uribe, E., Vega-Galvez, A., Miranda, M., Vergara, J., Gonzalez, E., et al. (2010). 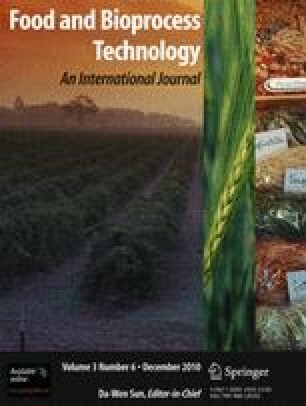 Effect of air temperature on drying kinetics, vitamin C, antioxidant activity, total phenolic content, non-enzymatic browning and firmness of blueberries variety O’Neil. Food Bioprocess Technology. doi: 10.1007/s11947-009-0306-8.